"...the Wizards trail right here in the 2nd quarter, Steve Buckhantz, Phil Chenier...."
I did a double take as those words came out of the bar speakers. It didn't sound anything like Troy Aikman and Joe Buck. In fact it kind of sounded like Phil Chenier and Steve Buck...hantz. I knew I was watching the Wizards game on television at a bar, a feat within itself, but I must have been dreaming. The NFL Playoffs were on and the Cowboys and Packers were battling in a very close contest. But sure enough my ears didn't deceive me. 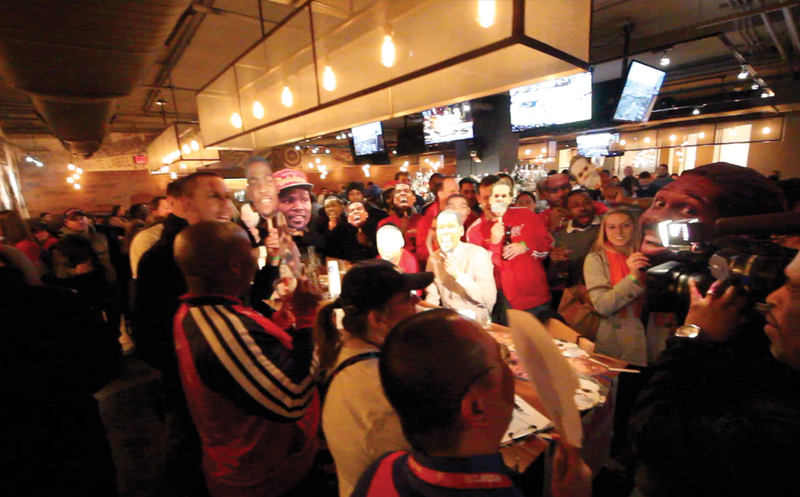 It was the Wizards game audio blasting loud throughout Smoke & Barrel in DC. And it was awesome! As the final song from T-Pain Brunch (wtf) played out at Adams Morgan's Smoke & Barrel the Wizards audio cut into the speakers. The Wiz were getting destroyed by the Hawks, then somehow down 2 points, then seconds later back down by double digits. While it wasn't the greatest game ever it sort of was, because a bunch of Wizards fans were able to follow along with the game and hear what was happening. It all started out with a random twitter question: "Who wants to see if a bar will have 30 tvs all on football or if 1 will throw a Wizards game on the side?" #Wizards play at 3pm today, who wants to see if a bar will have 30 tvs all on football or if 1 will throw a Wizards game on the side? 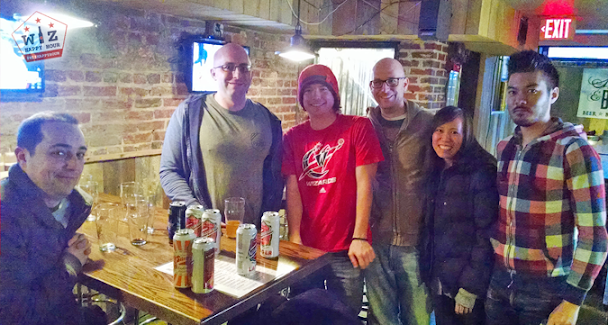 A few different Wizards fans responded in three different neighborhoods of the city and eventually it was decided we would meet up with Nick from Bullets Forever at a place where we knew the game would be on a TV (each table has it's own TV) in Adams Morgan. 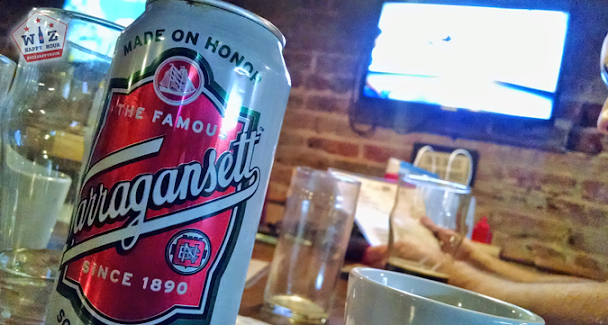 While the bar didn't have any specials per say, they did offer 16oz cans of Narragansett, a Rhode Island staple for $4. That was good enough for me and the crew as by the end of the game the bar may not have had any remaining in inventory. It was an up and down game and fun to watch, but equally fun to talk Wizards with a bunch of informed fans. Eventually Dan from the Sports Bog showed up and we had a nice little DC Sports blogging crew (RIP DC Sports Nexus) on hand as the final buzzer sounded, a Wizards loss. 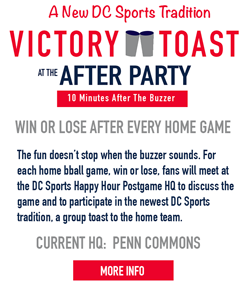 After the game the crowd of Wizards fans headed over to Ventnor Sports Cafe (the home of one of our next big watch parties) and kept the Sunday Funday going. By the end of the night, what seemed like 2am but was more like 7pm, I found myself with a jumbo slice in one hand and a Chipotle burrito in the other. A wonderful ending to a surprisingly really wonderful day.